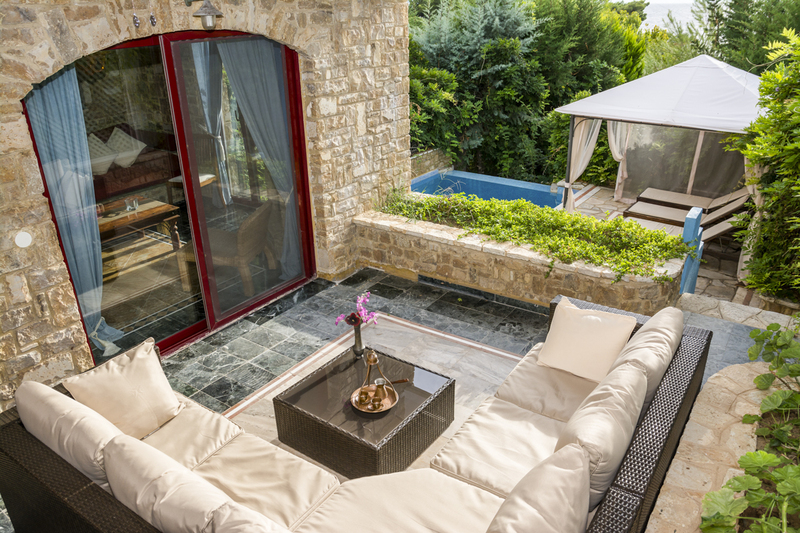 Three-bedroomed Dewberry Villa in charming Halkidiki on Greece’s northern coast has everything you need for a relaxing and enjoyable holiday. 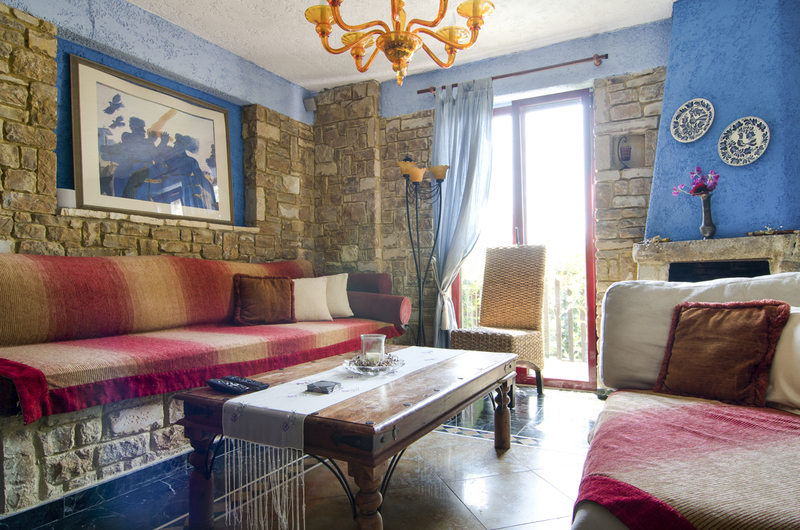 The villa is surrounded by tree-lined forests and has magnificent views of the Aegean Sea. Take your morning coffee with a dose of nature or while away the afternoon sun basking by your private swimming pool. With a beautiful grassy garden, there’s almost no need to leave, but a sandy and pebble Blue Flag swimming beach awaits you below. 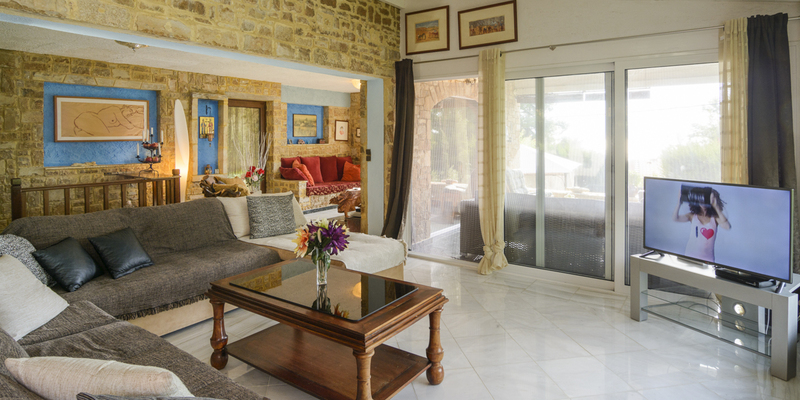 Rustic stone walls do the talking at this villa, and shots of colour come courtesy of pale blue-painted walls, dark wood furniture and cream-coloured curtains. The floor-to-ceiling windows and doors in the living room flood the space with natural light and bring the outdoors in. 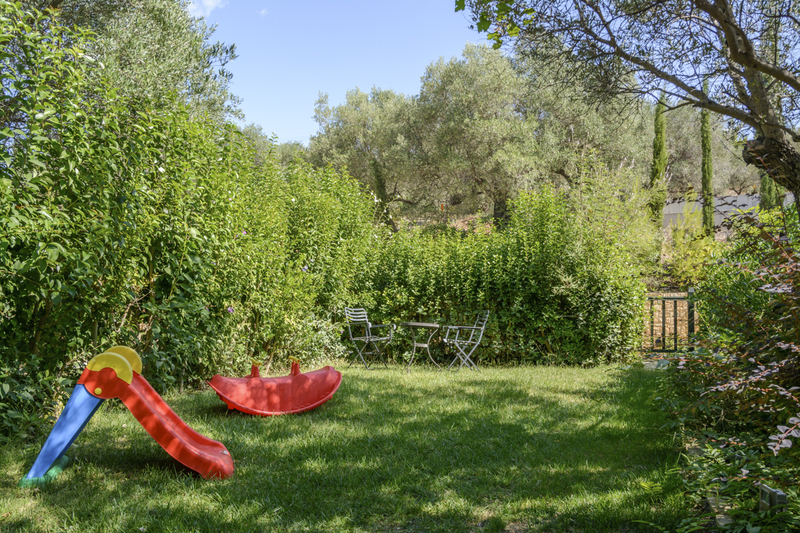 There’s also plenty of space for children to play and a shaded pergola area for when you need a more cooling respite. For a comfortable home-from-home stay, there’s also a fully-equipped kitchen, stocked with everything you might need for eating in. The cushioned sofas in the living room are perfect for spending some quality family time indoors, and there’s a classic stone-built fireplace for a traditional feel, Wi-Fi and plasma television. The three bedrooms, comfortably sleeping up to six, are all equally stylish, welcoming and spacious, with plenty of room to store your holiday belongings. If you can bring yourself to leave this exceptional villa, Akti Elias, a Blue Flag beach with crystal-clear waters that are ideal for swimming and snorkelling, is a short 500-metre walk away. Nikiti village, with local restaurants and quaint coffee shops, is also a short drive away, making Dewberry Villa an ideal starting out point for exploring this magnificent region. Whether you’re looking to rest your furrowed brow, explore the ancient history or immerse yourself in nature, Halkidiki has you covered. 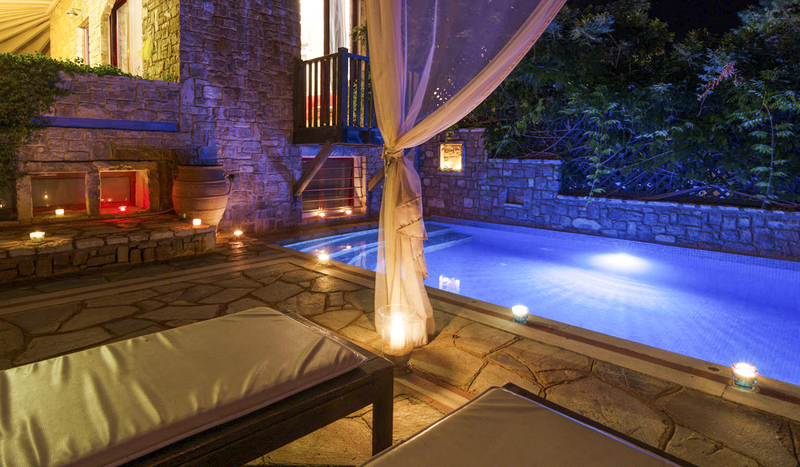 Dewberry Villa is nestled between trees in the charming region of Halkidiki on Greece’s northern coast. Whether you're an ancient history buff, water sports junkie or beach connoisseur, this popular yet laid-back holiday destination has you covered. 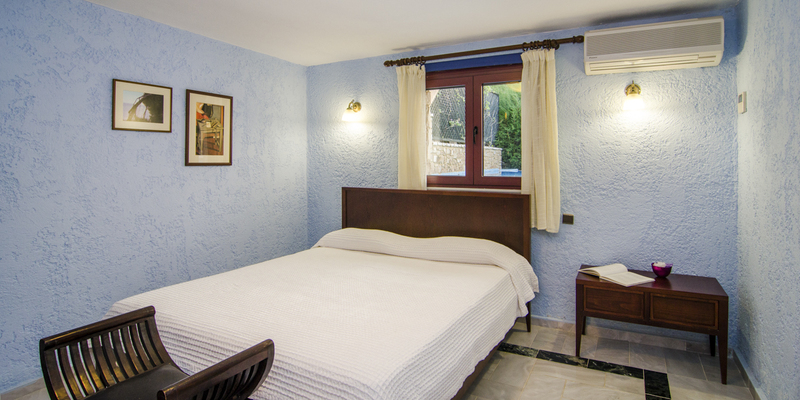 The villa is 500 metres from Akti Elias, a sheltered Blue Flag beach with clear waters that are ideal for swimming and snorkelling. Friendly traditional villages including Nikiti with plenty of shops, restaurants and cafes are also within driving distance. Halkidiki is flanked by the peninsulas Kassandra, Sithonia and Mount Athos. 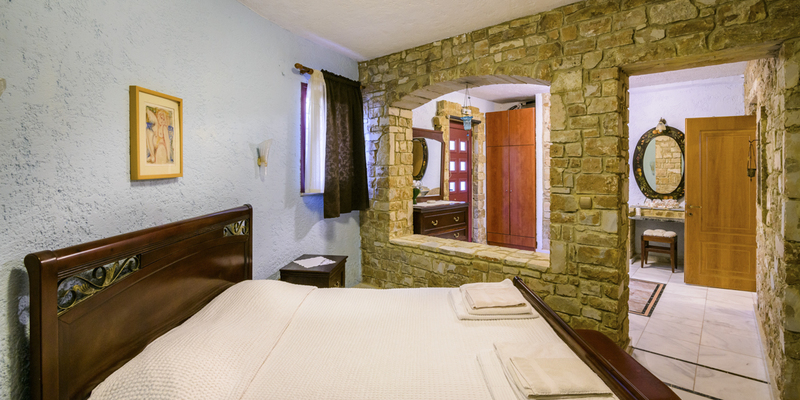 The mountainous region is known for its archaeological sites including Aristotle’s birthplace and natural delights. You can spend long afternoons exploring the dense pine forests or the ancient monasteries and churches. There are plenty of paths and trails for mountain biking or walking through the woods. Keep a look out for hidden springs for you to quench your thirst or to take Instagram-worthy pictures. You’ll find many shops and restaurants around the region, and you can spend lovely afternoons browsing the boutiques and charming cobbled streets and whitewashed bougainvillaea-draped houses. Foodies will delight in the small coves with fish tavernas and charming cafes, and there’s plenty of places to pick up fresh local produce to cook up a storm back at the villa. If it’s nightlife you’re after, Kassandra, the westernmost peninsula, is the most developed with bars and nightclubs. You can also drive to some more of the nearby villages. Taxiarchis is a popular choice with its famous homemade jams, and it’s also an excellent place to go mountain biking. Polygyros, the capital city of Halkidiki, with an Archaeological Museum, prominent churches including The Church of Metamorfosi, and a range of tavernas and restaurants is another excellent choice. Water lovers can take part in sports like windsurfing, kitesurfing and scuba diving. There are plenty of boat excursions that leave the coast, allowing you to discover the beautiful coral reefs, blue lagoons and deserted coves. We mustn’t forget to mention the Unesco-protected holy mountain of Athos, dotted with monasteries, Petralona Cave with its dazzling stalagmites and the village of Olympiada, Aristotle’s birthplace – all note-worthy sites that are not to be missed.